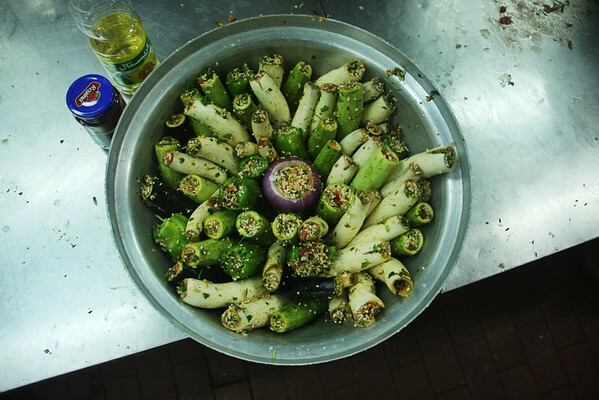 This week’s Edenic garden of stuffed and stewed vegetables, just in time for the snaps of winter hitting all over the place lately, comes from the kitchen of Heba Salem, author of Umm al-Dunya and the primary reason that I understand Egyptian Arabic, well, really at all. When I landed on the banks of the Nile in June, I didn’t even know how to say “today” (true story). Two hours ago I watched a play performed entirely in Egyptian and I understood nearly everything, including the jokes (well, ok, most of the jokes). 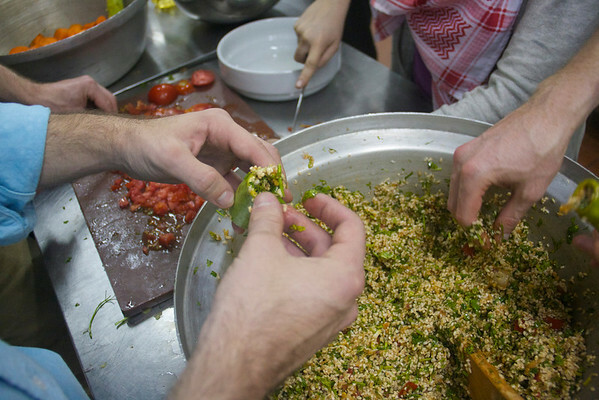 We made this recipe as a class because there is a rule that every Arabic ‘ammiyya class must have a cooking component (people often ask my why Arabic. Obviously this is why). In the rest of the world there are snow days, but in Egypt there are protest days, and because protests surrounding the trial-not-trial-after-all of Morsi last month blocked so much traffic, classes were cancelled that day and we convened for a make-up session one groggy Saturday morning in the industrial strength AUC kitchen. 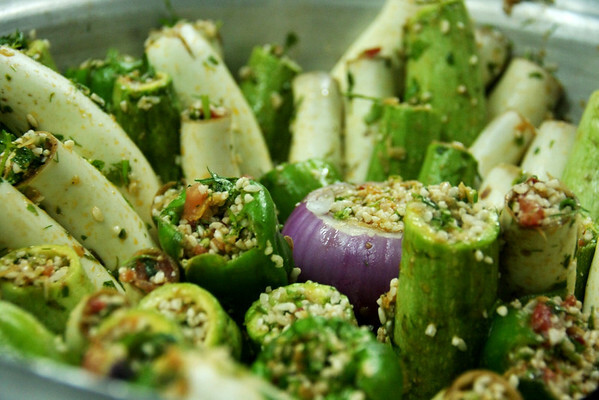 Mahshi, which simply means “stuffed,” is a staple dish throughout the Arab world. This Egyptian take on it is great because it’s so simple – it’s vegetarian, and you can use any vegetable you want (onions are not typically a mahshi staple but we had one leftover and figured it couldn’t hurt). 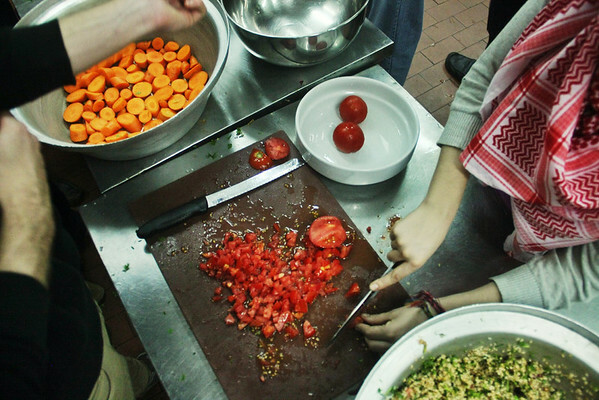 We cooked an enormous batch, stashed it in our communal fridge, and ate the leftovers for lunch for days. Don’t let the prospect of coring those veggies intimidate you; it’s easier than it looks. 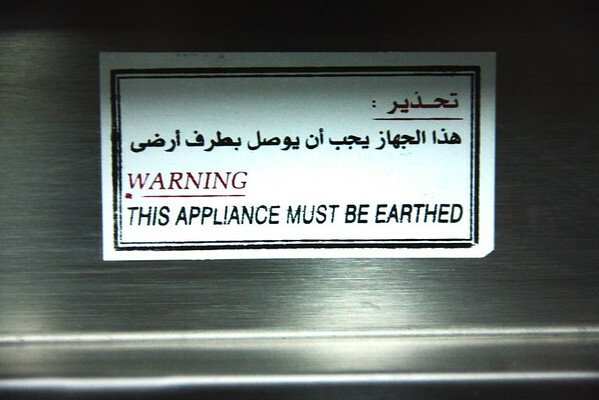 As the sign suggests, Egyptian cooking is nothing if not down to earth. This recipe is also perfect for the cook who loves rice but is not, perhaps, the best at cooking it well (and yes, I plead guilty to both charges) because the rice here proportions and cooks itself. Yep. I know. Proportions are a bit tricky to estimate and are hard to convert from my notes – both because my recipe notebook would later be covered in a five-spice holiday simple syrup that leaked out of its container, and also because we cooked in such massive proportions. In any case, take all the amounts given here with a grain of salt (or should I say, a grain of rice) and don’t worry too much about it. The important thing is that it looks nice. Assorted zucchini and eggplant work best – the smaller the eggplant are, the better. Reason #254 to become friends with your local farmer’s market folks: you can ask them to save the itty bitty eggplants for you for these purposes. 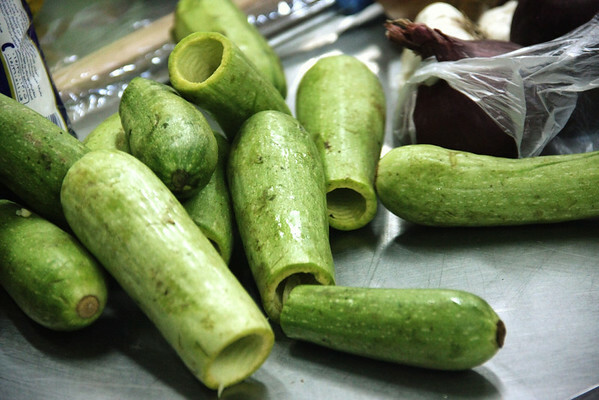 If you live in the Arab world you can probably buy these guys pre-cored, but coring the vegetables is fun and gratifying and I highly recommend giving it a whirl. Though if you’re gonna do it, you’ll need to buy a nifty corer thing. Is this called a corer in English? You can also stuff peppers, of course, which evolved to grow in a pre-cored state for those who don’t like the idea of coring veggies, or pretty much anything else you set your mind to. So, coring the veggies: the more you can scoop out, the better off you’ll be. But start small, inserting the corer nearly all the way through and simply spinning it a few times before gently scooping it out. Once you get a first good bit tunneled out, the rest becomes easy: you just work around scooping out a bit at a time. If you mess it up and slice through the edge, it’s really ok. You can stuff it anyway. 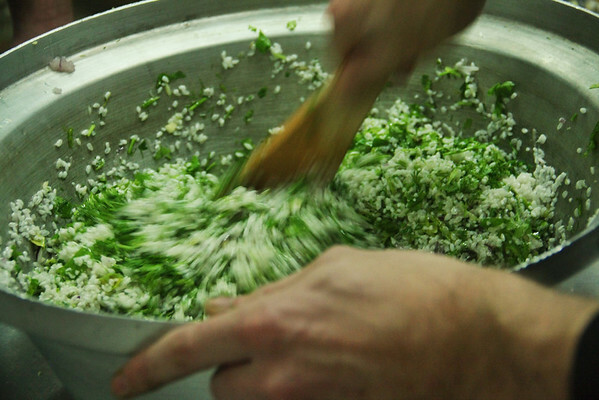 To make the stuffing, rinse your rice a few times, then mix it with the oil, tomato paste, spices, chopped herbs, grated onion, tomato, and garlic. Make sure everything is well-coated with oil as this will ensure that everything cooks well. The rest is fairly straightforward. Stuff those veggies with the stuffing. To cook, line a large sturdy pot (the first time I drafted this I typed bot. Hi, Egypt) with the carrots (a bed of carrots. Doesn’t that sound nice?). You’re going to want a pot that is about big enough to handle all of your stuffed veggies nestled together, propped upright (like in the photos). Drizzle everything with a bit more oil, and then cover up to 2/3 of the way with your broth. If you have leftover rice, you can cook it as is in its own pot (the regular rice way) and it makes a very nice rice dish for a side for another day. Set it on the stove on medium ish heat. And this is the beauty part: you just cook them, partially covered, until the rice is done. Towards the end take off the lid so that most of your liquid boils off. Not only does the rice take care of itself and not burn the bottom of the pot in this scenario, it actually tells you when it’s time to eat. Thank you, rice. Thank you, Heba. 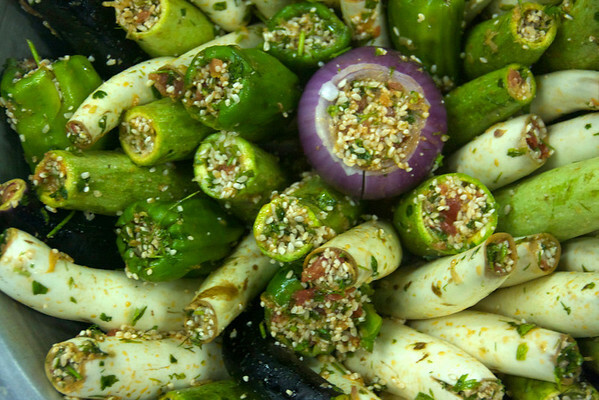 Next step is to create a special mahshi filling for each Arab cuisine to make a little Arab-League-in-a-pot, but that will have to wait for another day. View all these photos and more here. Half of the proceeds from prints and cards sold this month will go to help Syrians affected by the conflict.